Recent advancements in technology now allow periodontists to replace a full arch of teeth in a single day with fewer dental implants than ever before. There are several treatment systems, or procedures that do this. 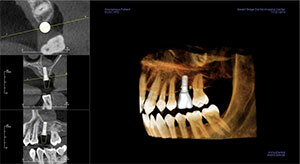 This article is an overview of the technology, general procedure and implant systems available. Not only do missing teeth & traditional dentures impact your ability to eat and speak properly, they reduce the health of your jaw and can affect your self-confidence. Dental implants are the preferred method for replacing missing teeth, whether you are missing a single tooth or a full arch. Recent advancements in dentistry have enabled patients to walk out of a dental office with implant-secured teeth in a single day. Although many general & family dentists promote that they can surgically place implants, Periodontists, receive at least an additional 3 years of intense study on the treatment of gum disease and the placement of dental implants. Implant supported fixed dentures feel natural and comfortable. Taste and temperature of food are no longer blocked by bulky dentures covering the roof of your mouth. Bone loss is prevented by stimulation of the jaw bone. Dental implants don't slip like dentures do. Cleaning your dental implants is as simple as brushing natural teeth. Same day teeth treatment can be completed with a fixed or removable prosthesis. A fixed implant bridge is a permanent set of artificial teeth attached directly to your implants with either screws or strong bonding cement. This fixed denture should function just like your natural teeth and are typically made from beautiful, durable porcelain fused to metal. 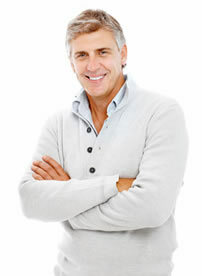 In contrast, an implant overdenture is a much larger removable prosthesis. It looks and feels much like a conventional denture, but it is attached to your gums via implants rather than suction. Unlike a fixed implant bridge (implant supported fixed denture), an implant overdenture must be removed and cleaned overnight. These artificial teeth can be made from porcelain so they are sturdy and cosmetic. The successful placement of dental implants depends on the amount of bone available. In the past, patients were turned away because of lack of sufficient bone structure available. With advanced 3D imaging, many periodontists are now able to place implants strategically to take advantage of what bone is left. Not only does this help patients with severe bone loss, but it allows periodontists to place as few as 4 implants to support an entire arch of teeth. One of the most important tools in same day teeth is high-resolution computed tomography. A CT machine takes a series of continuous x-rays to generate a 3-dimensional model of patients’ teeth, gums, and jawbone. Your dentist can complete a minimally invasive CT scan in mere minutes. Next, he or she can use this data to create an individualized implant treatment and restoration plan. Your periodontist can also use the digital data collected from CT scans, x-rays, and impressions to create a customized surgical guide. This is an appliance fitted to your particular smile that allows the periodontist to precisely & safely insert titanium implants into your jawbone. Using a surgical guide minimizes your risks for complications and makes the placement procedure much shorter. Utilizing state-of-the-art digital equipment to model the mouth and fabricate a surgical guide allows your periodontist to map out your procedure ahead of time so everything is ready for you on the day of your appointment. On the day of your same day teeth placement appointment, your implant dentist will administer anesthesia and sedation to keep you calm and comfortable. Next, he or she will use your surgical guide and personalized treatment plan to insert between four and eight titanium implants per arch. A temporary custom-made denture will then be placed. This prosthesis will allow you to eat, speak, and smile comfortably as soon as you leave the office. You will wear your temporary set of artificial teeth for approximately ten weeks while your tissue heals and your titanium implants integrate with your jawbone. Once you are sufficiently recovered from your procedure, your implant dentist will see you for another visit, during which he or she will place your beautiful permanent restoration. TeethXPress® by BioHorizons. This procedure involves inserting four to five titanium implants. TeethXPress® uses flexible, tapered, Laser-Lok implant technology to integrate well with bone tissue and provide a stable hold for a partial or complete denture. All-on-4™ by Nobel Biocare. As its name suggests, All-on-4™ by Nobel Biocare secures dentures with as few as four implants per arch. RevitaliZe™ by Zimmer. The RevitaliZe™ by Zimmer system usually uses four strategically placed titanium implants per arch to hold your prosthesis. These systems use the same basic technology to restore your smile, but each has distinctive benefits and disadvantages. Speak with your implant dentist to find out which brand of same day teeth may be most appropriate for you. With innovative same day teeth treatment, you can begin enjoying your new smile immediately. As discussed above, several months after your initial procedure, you will come back in to your implant dentist's office for permanent denture placement. The daily hygiene protocols for your denture will depend on the type you’ve chosen. Patients with overdentures will need to remove them each night to clean them, while those with fixed implant bridges (or implant supported dentures) will brush and floss their prostheses just like their existing teeth. Patients who have undergone same day teeth treatment should attend routine cleanings three times per year to ensure that their fixed implant dentures remain safe and sanitary. Dental implants are not susceptible to typical periodontal disease, but they can develop an infection known as peri-implantitis, so it is important to maintain them properly. Once a year, your periodontist will take 3-dimensional CT scans of your mouth to monitor your bone health and suggest appropriate treatment as needed. With proper upkeep, your same day teeth should last for many years.